Trackpad – How I finally learned how to use one! For years my wife has been trying to tell me how to use my computer correctly, but as a “tech-guy” I refused to think that I could learn something from her. Afterall, I have been using a computer much longer and pretty much taught her everything she knows on how to use one. The main difference, I am a PC guy and she is a Mac girl. I got her first MacBook as an anniversary gift in 2010…and she is still using that chunk of aluminum (with a few upgrades along the way). So for 8 years she has been using the trackpad on the mac and learned to not use a mouse. I have been limited to using a mouse and have gone through so many usb and bluetooth connected mice, more than I can count. I have really hated traveling with the limited space of the folding tray on the airplanes and felt that I needed to conform to trying to use the trackpad. One day we were working side by side and she started to make fun of how I used the trackpad. 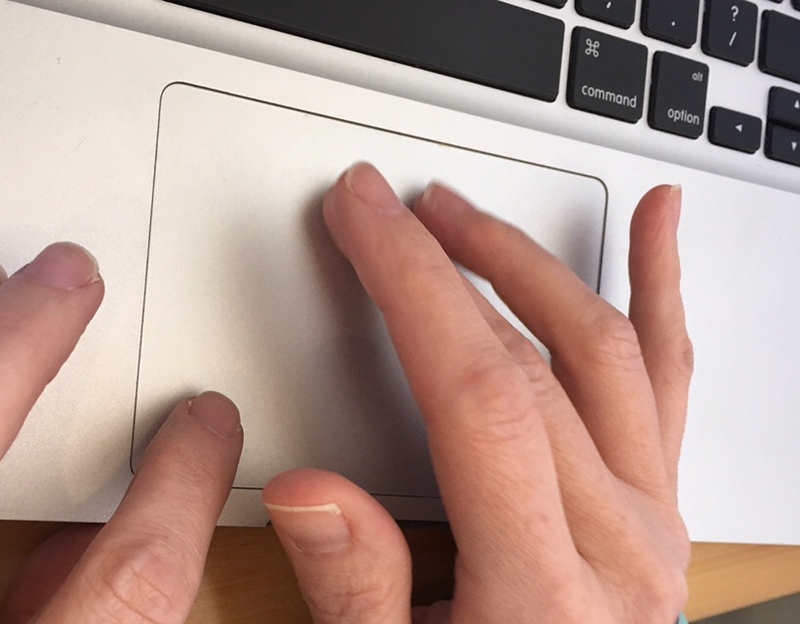 I looked like a 80 year old person learning to type on the first typewriter using one finger at a time, but instead of using two hands I was using one hand on the trackpad like I used a mouse – navigating with the pointer finger and then double clicking to select or open. I struggled moving panels across the screen and moving files into folders. Every now and then I would look up to see a smirk on her face. She would say, “use both hands silly” and I refused to think I needed to use both hands. Afterall, I did not use both hands with a mouse…why would I need two hands to use a silly trackpad. I thought to myself, “I refuse!” Then one day I looked over to see what she was doing. Left hand to select and right hand to move around. The lightbulb went off in my head and I got it. Why did she not explain this to me? Because. It was fun for her to see me struggle, naturally. Now I am faster than ever – maybe faster than when I use a mouse since my hands are so close to the keyboard and the trackpad. I don’t need to move my hand to the mouse and back to the keyboard. I even find myself using my left thumb to select and my right thumb to navigate never leaving my other fingers from the keyboard. I know, you all learned this 8 years ago like my wife did… and longer ago if you are a millenial. I am a convert to the trackpad and now question what else I have missed the last 8 years that I refused to learn. Lesson learned. I will be open to learning…even from those who I think might not have something to teach me. I don’t typically say that about technology unless I really don’t have anything else to explain why I have been so impressed. Two technologies have made the list this year. The first is analog and the second is cutting edge digital. Have you seen the Pilot FriXion ink pens? http://pilotpen.us/brands/frixion/When Courtney broke one out this week I just about lost it. I said to her, “no freakin way!” I looked them up online and they are called FriXion…as in Yes FreaXion Way. Check them out! The second thing to impress me this year…so far…was been the video chat app appear.in. I have been using it c casually with people I want to chat with one one one. It includes screen sharing as well. Very fast, very clear, very easy to use. Take a peak into our private chat room appear.in/5115design (we might lock you out if we happen to be using it…a nice feature). Thank you Åsmund for sharing this one with me! Go Norway on leading the tech world once again! A few bonus tech to share…I learned for a great online music alternative to Pandora called Jango http://www.jango.com/I must been better because it as a millennial that told me about it. And finally a really great app to keep your family in sync with each other, check out Life360 https://www.life360.com/ – thank you Julie for sharing that one. If see other cool technology (analog or digital) let me know. Checkout the AWE this month if you are in the bay area http://www.augmentedworldexpo.com/ if you are interested in the latest in AR/VR. I am still on the fence on going this year, but I have gone in the past and it as awesome. Thank you Cesar for introducing me to AWE. What Big AEC problem are you trying to solve? 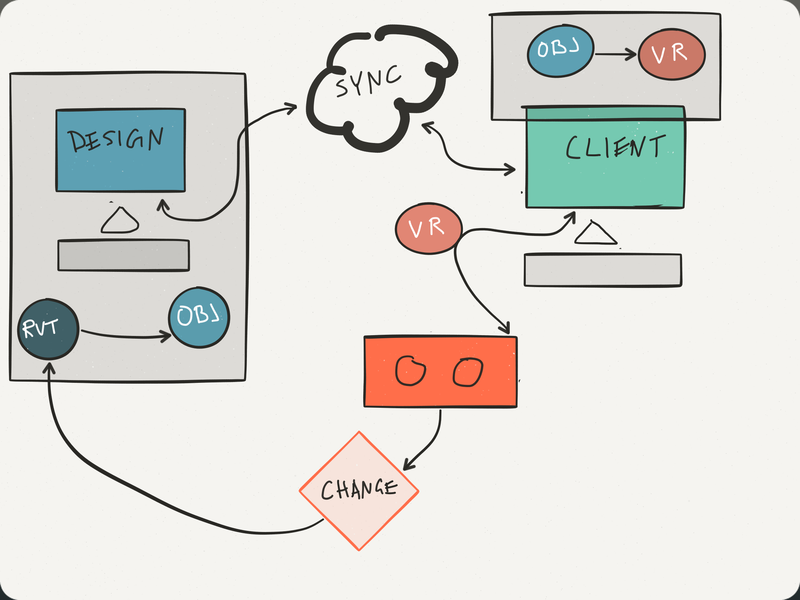 The design process includes change, lots of interactions and fast. Communication with clients can be a challenge when trying to include them in the process. In recent months the evolution of Vurtial Reality has started to get a stronger foothold in the AEC industry. 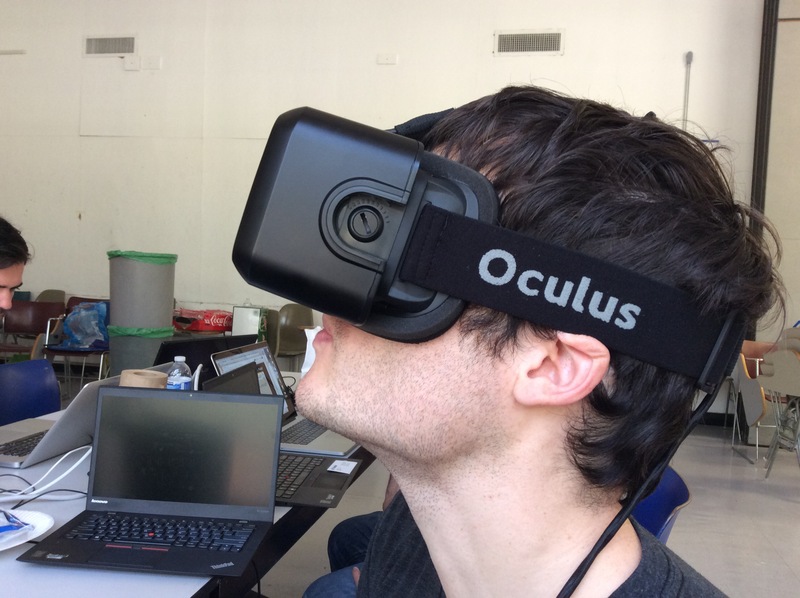 We are not building games, but real human experiences in the AEC world. We do not experience this through the flat 2D drawings or high resolution renderings. The hardware is starting to catchup to the dream of Virtial experience prior to construction with advancements in heads up display gear. 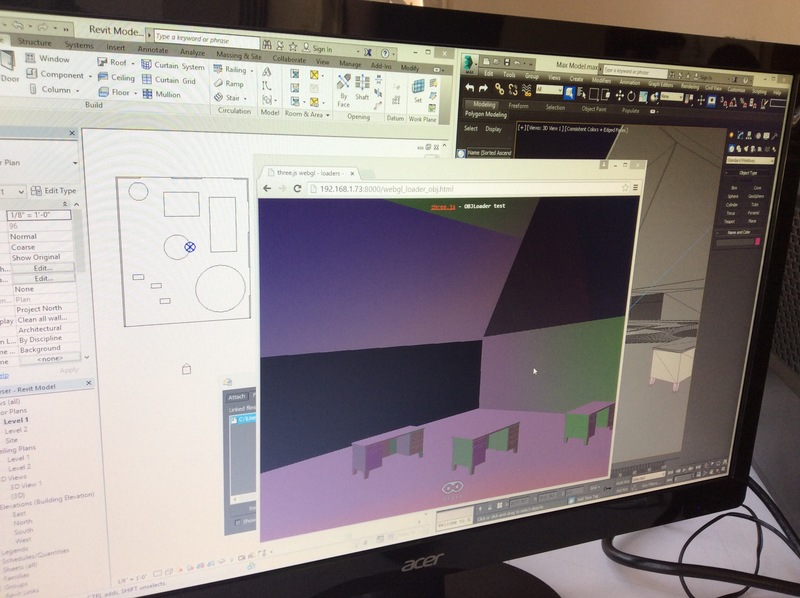 Using an Oculus Rift DK2, Revit, and open source we have linked the hardware, the design and the web. Using three.js and webgl and an OBJ file format we are able to view and move around using a url. The client can simply open a browser link from an email, connect a future commercially available Heads Up Display (HUD) like Oculus Rift (launching next year) and see the design. “Can you change ‘this here’?” ask the client. Designer updates the design, saves and uploads the file, the browser refreshes and the client sees the change. They continue this process with the client using the same link. The url site can be accessed by anyone with the link and can be experienced by any number of people at the same time. Can your solution be implemented on Monday? Yes, this is mostly using existing tools and open source software. How much of the code was built this weekend? Because we’re mostly reusing lots of open source code, very little was built this weekend. However, all that was built by us Was built this weekend. Medium (Easy for the designer, medium challenge for developer). Using a very new web VR compatibility limited us to using the nightly build of Chromium, using a developer kit of a yet to be sold hardware Rift, and file sync system (in this case detopbox) created some challenges, but a simple understandable process. Bonus: What open standards do you support or use? We used OBJ open 3D file format, threeJS rendering in browser, and webVR open standards. Here is us at AEC Hackathon 2.3 in the live demo on YouTube.